I decided to have an hour's pike fishing the other day.My first task was to catch a couple of baits, so I float fished maggots in a side stream. 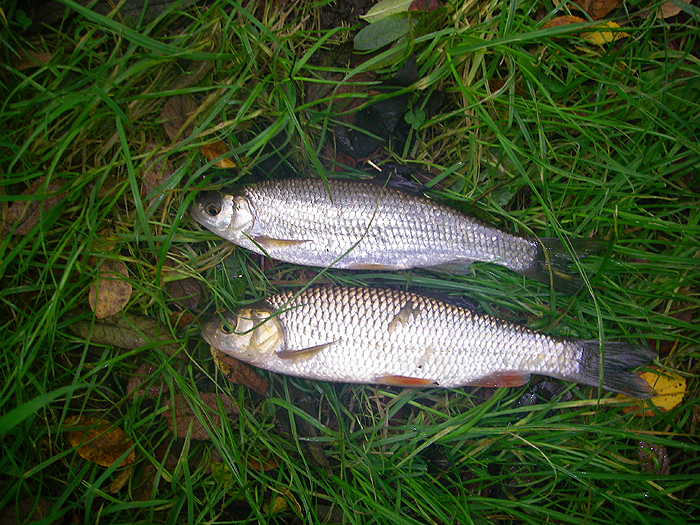 The first catch was a small chub followed quickly by a decent dace. I thought they might make a nice comparison so I took a few pictures before setting off after the pike. My pike tackle was the usual debarbed circle hook on a wire trace suspended under a piece of wine bottle cork. Within minutes I had a bite and the float shot under. 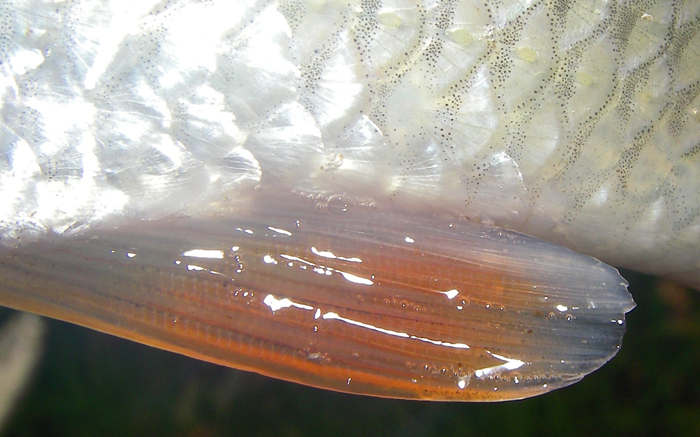 I tightened to find myself attached to a seven or eight pounder which tore off into a mass of pondweed. 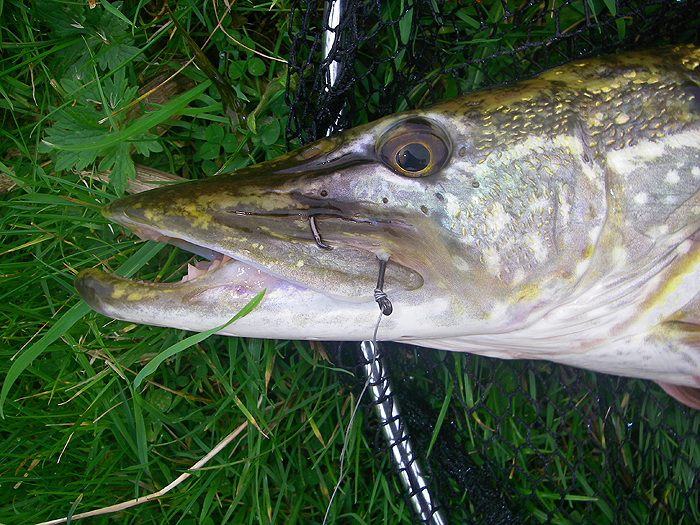 After a bit of heaving the hook came free but, unfortunately, so did the pike. Bother!!! 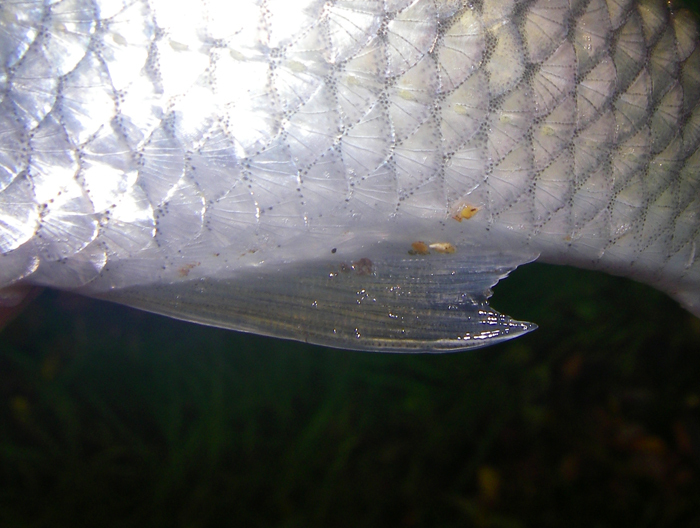 I shifted twenty metres upstream and dropped the next bait into a hole under some overhanging brambles. 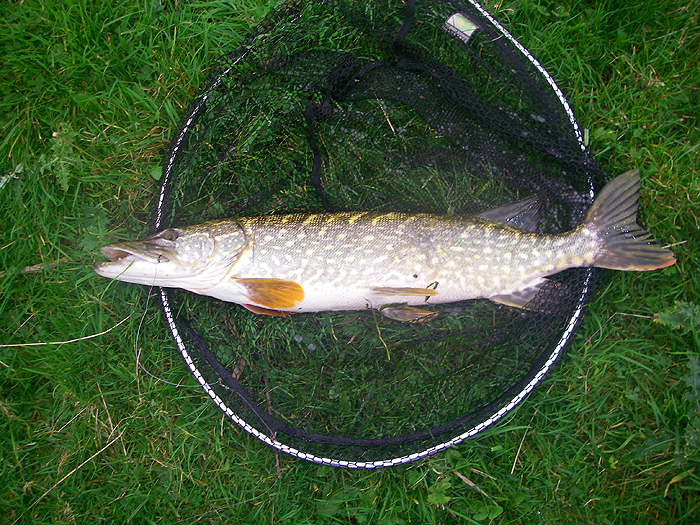 Again it was promptly taken by a bigger pike. The fish zipped out into mid-stream so I was able to guide it round the bankside bushes before netting it. The hook was nicely in the edge of the jaw so after a couple of pictures I unhooked the pike and returned it to the water. Excellent! For twenty minutes or so I trudged along the muddy banks trying a couple of likely spots with no joy. It was getting close to 'going home time' but I fancied trying the end of a ditch which was well filled because of the high water. It was tricky situation with submerged tree trunks on both sides. Still, 'nothing ventured nothing gained' and it looked really pikey. I was right and almost at once the float shot away. I tightened straight away and with the clutch screaming a large pike shot out of the ditch, round the tree trunks and into the main river. I bent the rod and with some difficulty managed to get the fish back into the ditch under my rod tip. It surfaced, it thrashed, it beat the water to foam and then, with the clutch tight, it made another powerful run out of the ditch and into the river. This time I had no chance, the pike turned downstream wrapping the line round one of the trees. Ping went the trace knot. I could have cried. It would have been my first twenty of the winter. At least it was likely to rid itself of the hook without too much trouble.